I had a conversation not too long ago with an educator who pushed back a little on the topic of student empowerment. The teacher asserted that he went to school to be trained as a professional, is an expert in his discipline, and knows the best methods and strategies for teaching the students in his classes. The line of thinking seemed to indicate that students are not equipped to take a more active role in directing their own learning. In another conversation with a different educator, I suggested that students and teachers should partner in the learning process and that students' voices should be heard. But there was some push back. The person shared that some teachers would not like the term partner with students. It seems too much like students and teachers are on the same level. Of course, I realize teachers assume a position of authority inherent in their role. And while teachers should seek to share power with students, they should also maintain a leadership role. When necessary, they can direct, guide, or even say no. But when teachers truly honor student voices and really listen, it's often amazing to see the initiative, wisdom, and commitment students will display. I guess you can see I'm a big believe in student empowerment. 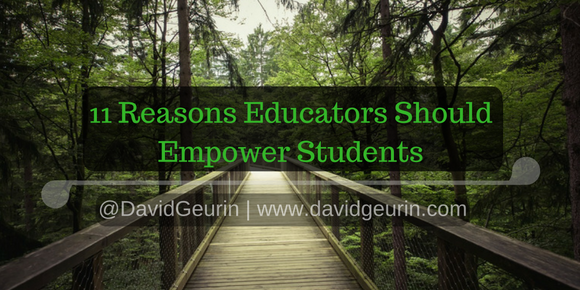 Actually, I'm a believer in student and teacher empowerment, and empowerment in general. I believe empowerment is one of the essential purposes of pursuing education. The more you know, the better you are equipped to make good decisions, by your own choice. Empowerment is increasing the ability to act on one's own behalf or on the behalf of the community to accomplish a goal or create an outcome. It is an essential part of our freedom and liberty in this country. In fact, it is wrong to keep capable people controlled or limited when they can do it on their own. When students are empowered learners, we equip them to make positive choices, to take control of their circumstances, and to go forward with their learning and goals. It's empowering! 1. To develop more independent learners. The best learning is not dependent learning. It is learning that is self-directed and intrinsically motivated. 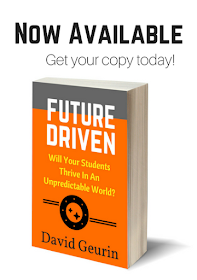 School should be a place where students are expected to take greater ownership of learning. 2. To create life long learners. As I reflect on my school days, very little I experienced led me to be the life long learner I am today. That's not to say I didn't learn quite a bit in school, but I didn't learn how to pursue learning for life. I learned that outside of school. I don't think it has to be that way. 3. 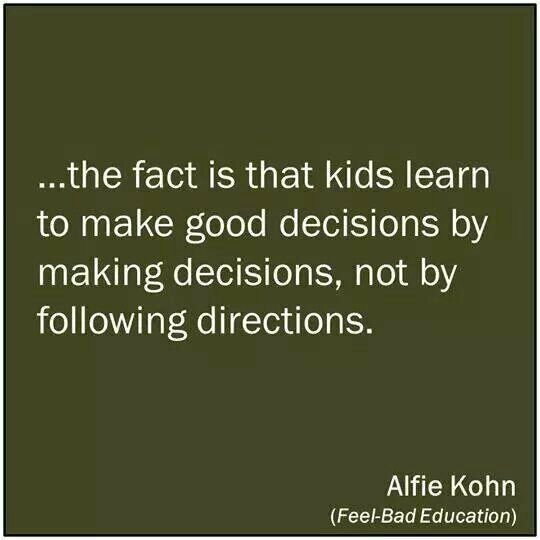 To help students learn to make good decisions. 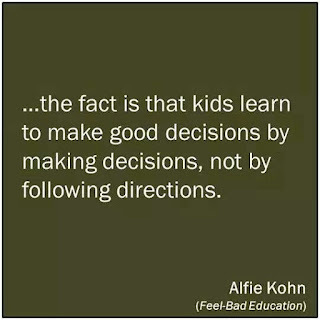 Students need practice making decisions about their own learning. They need to learn about their own strengths and weakness and how their decisions affect self and others. When there are few choices in learning, students are being robbed of the opportunity to grow as a decision-maker. 4. To foster more relevance in learning. 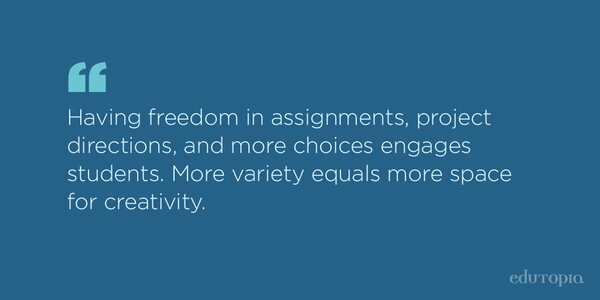 When students are empowered, learning becomes more relevant. Instead of just doing something as I'm told, I am able to learn things that are of interest and value to me. Teachers can help provide the context to expand and challenge the interests of students but not to make all the decisions for them. I believe students would take a harder look at what is really valuable if they were given more opportunities to be empowered. 5. To help students find their passions. I believe this is one of the most important parts of a well-rounded education. Students need to find things they are passionate about. Learning is lifeless for the most part unless there is passion. When students discover passions, they care will care more and do more. If I'm passionate about something, I will invest in that passion even when it's hard. Students will be more likely to find passions when they are empowered as learners. 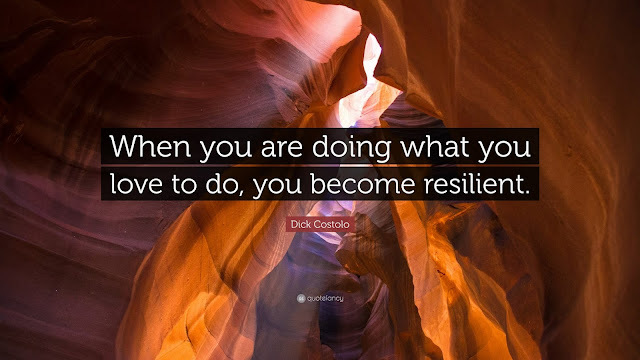 Resilience develops from suffering a failure but caring enough to press on in the face of difficulty. 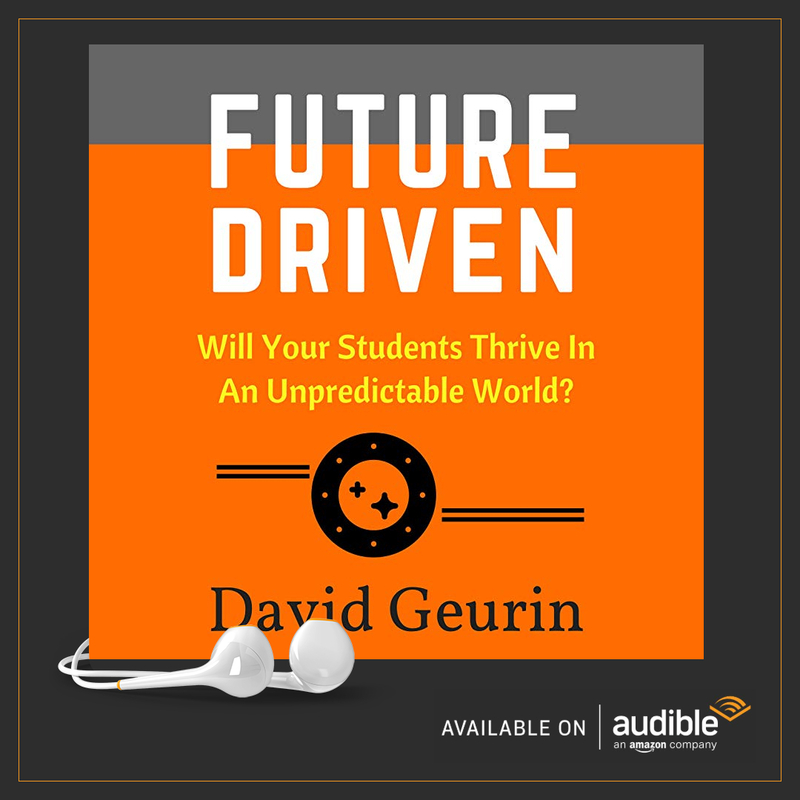 School that is mostly compliance-driven results in students who want to do just enough to get by, or they want to take shortcuts or work the system to get a certain result (a good grade or a diploma for instance). Learning that is empowered results in students who will strive to overcome obstacles and do more than is expected. Resilience is closely tied to sense of purpose, support from others, and a positive outlook. I believe empowered learners are more likely to understand and exhibit empathy. Empowered learners see how they can make a difference in the world. They see how their learning can impact others. How it can help a friend, or solve a problem, or challenge someone's thinking. If we want to create students who are world-changers we have to give them opportunities to make a difference now. Students need to have opportunities, as part of their education, to recognize injustice and then do something about it. When I talk with students about leadership, I can see that many view it as having and wielding power. I think much of this thinking comes from the experience they've had in school where most all of the power is consolidated with teachers and administration. When we empower learners, we share power with them to help them develop the skills to own power and also share it with others. It's not about telling someone else what to do. It's about working with others to accomplish a greater good. At its best, it starts with humility and service. Students need to see this modeled, and they need to have the opportunity to practice it as well. 9. To develop better global citizens. Young people want to make a difference in the world, but they are often immobilized by a system that tells them every move to make. Empowerment allows students to make a difference now. Empowerment asks students, "What problem will you solve? How can you make the world a better place?" But there is a choice. Students will learn to be better citizens when they have the chance to lead and speak up on causes that are important to them. Creativity requires unconventional thinking and will not thrive in a compliance based culture. Empowerment promotes creative thinking. It's not about finding right answers. It's about looking at problems in novel ways. Curiosity is also supported through decisions that empower others. We aren't likely to be curious about things that aren't personally meaningful. But when we are empowered to pursue our own questions, to investigate, to explore ideas, then our curiosity becomes an incredible pathway to learning. 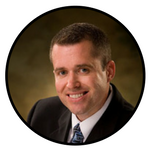 Question: What are your thoughts on student empowerment? Why does this seem scary for so many educators? I want to hear from you. Leave a comment below or respond on Twitter or Facebook.